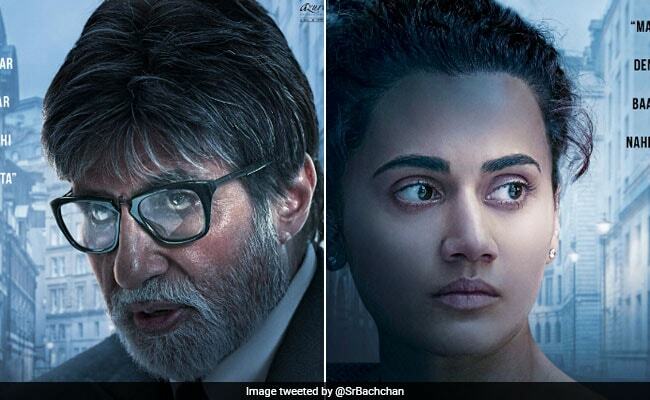 The posters of Amitabh Bachchan and Taapsee Pannu from their upcoming film Badla was unveiled today and guess who was the first one to share the first looks of the actors on social media? It was none other than Shah Rukh Khan, who also reminded fans and followers about the trailer release date of the film. "Main aap se badla lene aa raha hoon Amitabh Bachchan saab! Taiyaar rahiyega," he wrote in a tweet. He followed the tweet with another, sharing two posters from the film. "Ab mahaul kuch Badla Badla sa lag raha hai. Here are the first posters of Badla featuring Amitabh Bachchan and Taapsee Pannu! Directed by Sujoy Ghosh. #BadlaTrailerTomorrow," he wrote. Responding to Shah Rukh's tweet, Amitabh Bachchan wrote: "Arey bhai Shah Rukh Khan, Badla lene ka time toh nikal gaya .. Ab toh sab ko Badla dene ka time hai." Big B and Taapsee sport intense looks in the posters. Badla will be Amitabh Bachchan's third film with director Sujoy Ghosh. The 76-year-old actor had earlier worked with Sujoy Ghosh in Aladin and TE3N (which he produced). Meanwhile, Badla is Amitabh Bachchan's second collaboration with actress Taapsee Pannu. The actors have worked together in 2016's PINK. Taapsee, who is excited to share the screen with herPINK co-actor yet again, told news agency IANS: "When you are in safe hands of a brilliant filmmaker and an ace co-actor, there is nothing to fear." Last seen in Thugs Of Hindostan opposite Aamir Khan, Amitabh Bachchan also has Brahmastra and Jhund in the pipeline. Taapsee Pannu will start shooting for director Tushar Hiranandani's film Saand Ki Aankh, which tracks the lives of world's oldest sharpshooters Chandro and Prakashi Tomar. The film also stars Bhumi Pednekar.